Setting the industry benchmark in industrial flooring for 25 years. With over 25 years experience, ASCOAT are the leaders in industrial flooring and can provide you with a specialist industrial flooring solution to meet your needs. ASCOAT’s team of specialist applicators have the experience and expertise to deliver the optimum flooring solution – even for the toughest environments. From fast, cost effective concrete sealing solutions, through to high build epoxy, self-levelled, chemical, temperature and static resistant seamless installations, ASCOAT has the solution. Importantly, ASCOAT has both the resources and personnel to meet the demands of projects of all sizes and complexity – from small Maintenance and Remediation works, through to the largest Major Capital Works projects. 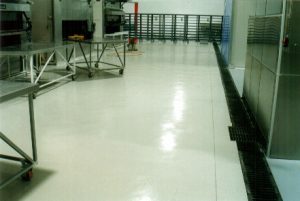 Heat and Chemical Resistant Polyurethane Floors for demanding wet processing environments. Decorative flooring systems for Public Areas, Retail, Health and Educational facilities – smooth or textured, stain and wear resistant. Maintenance and Remediation of worn and damaged doors, joints, coves, line marking, tactiles and safety barriers. 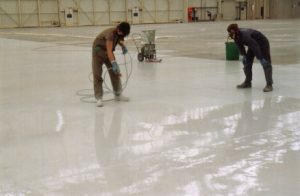 Heavy Duty Chemical Lining Systems for Primary and Secondary Containment areas. Provision of ultra smooth, highly chemical and impact resistant doors for Clean Room or similar environments. Economical and rapid, sealing and dust-proofing of Warehouses, Factories and Car Parks. Static Control and Low Friction Surfaces. Specialist skills to meet the needs of even the most demanding installations. Fully trained, qualified and experienced staff. End to End Quality and Management Systems ensure quality, scheduling and budget is achieved on every project. Whatever your industry or environment, ASCOAT has an ideal industrial flooring solution to meet your needs.